Watches can be extremely expensive to manufacture. Many luxury watch brands use precious metals and spend endless amounts of time designing new movements and caliber. Many of these watches are pieced together by hand, and can take many months to produce. Movements aren’t cheap to develop! Many luxury brands develop their own movements which can take many months to master. A lot of time and money go into developing a movement as opposed to outsourcing for cheaper Japanese Quartz movement. Luxury brand watches are designed and manufactured by highly trained artists and watchmakers. Designing and building a watch takes a lot of time, and many watchmakers are paid a high salary. 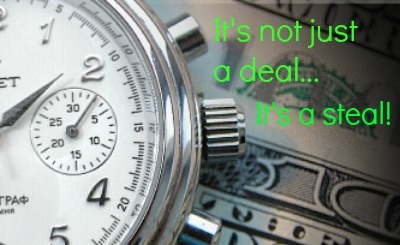 Watches are more expensive than the sum of their parts! It’s important to consider the manufacturing, design, workers, royalties, and licensing costs that go into many luxury watches. A watch may cost a lot less than the selling price, but overall the entire process of building the watch exhausts a lot of money and resources. Watches can be used as a status symbol! As petty as the concept may seem, if a person is proud of their accomplishments and wealth they want people to know how far they’ve come. Companies can produce small quantities of watches with very high price-tags, as they know a small market of people may be interested in purchasing them. The smaller the quantity of watch, the chances of the watch being designed from extremely rare materials and renowned watchmakers justifies the price tag. Luckily, AuthenticWatches.com has a large selection of watches in our daily deals and our up to 75% off sections, as well as free overnight shipping and free international shipping on all purchases over $500! This entry was posted in Sales & Deals and tagged brand name watches, deals, deals and steals, designer, free international shipping, free overnight shipping, luxury watches, sales, steals. Bookmark the permalink.